Smart WiFi touch control stepless dimmer switch This 1 Gang touch dimmer switch supports maximum power of 400W that can work with most lights with dimming function. This dimmer provides the maximum amount of stepless dimming range, user can dim the light to save more electricity and extend bulb life. Premium quality Made of flame-resistant ABS shell and toughened glass panel that ensures a good durability. Luxury and fashion design that.. Smart Light Switch Wifi Touch Panel Dimmer Remote Control Alexa & Google Home. 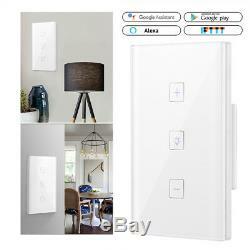 Smart WiFi touch control stepless dimmer switch. This 1 Gang touch dimmer switch supports maximum power of 400W that can work with most lights with dimming function. Made of flame-resistant ABS shell and toughened glass panel that ensures a good durability. Luxury and fashion design that can be well fit into most places with different decorate style. Compatible with Amazon Alexa / Google Home / IFTTT. User can control this stepless WiFi dimmer via voice through Alexa / Google device to turn on/off the light and adjust the brightness. Connect APP with IFTTT, then you can create triggers and actions on IFTTT website/APP and control your lights. These make the operation more convenient and more intelligent. Support timer on/off function and it can set many groups of timer settings. Support network off work function, the timer setting can work as usual even if the network is shutting down. When installing, this Wi-Fi touch switch need to connect to a Neutral line. This dimmer only supports to adjust the light brightness, it can not change the light color. The light connect with this dimmer must support diming function. Type: 1 Gang Touch Wi-Fi Dimmer Material: Flame-resistant ABS, toughened glass Quantity: 1 pc/4/10pcs Item Color: White. Rated Voltage: AC 100V-240V, 50/60Hz Max. Load: 400W / gang (Resistive load) Max. Working Current: 2A Standby Consumption: 0.1mA Wi-Fi: 2.4GHz, IEEE 802.11 b/g/n Wireless Range (the distance between wifi router and dimmer): <30m / 98ft (lndoor) App: Smart Life. OS Supported: Android and iOS Application: LED, Incandescent lamp, halogen lamp Power Supply: Neutral and Live wire Work Environment. 080°C, 1093% Certification: CE, RoHS, FCC Installment Pitch of Holes: 82.5mm (US standard) Size: 127.63.2cm / 4.731.3 (LWH) Net Weight: 0.165kg / 5.8oz. 1Wi-Fi touch light switch 1English user manual 2Screw 1Package box. 1 Gang Touch Wi-Fi Dimmer. 400W / gang (Resistive load). 2.4GHz, IEEE 802.11 b/g/n. LED, Incandescent lamp, halogen lamp. 127.63.2cm / 4.731.3 (LWH). 0.165kg / 5.8oz. And will be received in 5 days after dispatched. Orders will be processed instantly and dispatched within 3 days, so we do. [Datacaciques code start, don't modify it]. If you do not receive your item after 35 days. We stand behind every product we sell. Feedback is very important to us. If any questions and ideas, just feel free to tell us , we are here for you or will be back to you within 24 hours. Our reputation for excellent customer service has been built over 5 years of trading by providing great value and support to all of our customers. Please come back soon and visit us again! High Quality, Best Price & Excellent Service. Flexible 24/48 LED Aquarium Light Arm Clip on Plant Grow Fish Tank Lighting Lamp. Clear Acrylic Makeup Case Storage Cosmetic Organizer Drawer Insert Holder Box. Universal Table/Desk Holder Tablet Stand Mount For iPad Mini/ Air 1 2 3 4 Retina. Newest PC/Laptop VGA to HDTV Monitor AV RCA Composite S-video Converter Adapter. Vintage Retro Metal Small Round Mirrored Folding Foldable Sunglasses Polarized. 100pc Aluminium Foil Nail Art Soak Off Acrylic Gel Polish Nail Wraps Remover Set. The item "Smart Light Switch Wifi Touch Panel Dimmer Remote Control Alexa & Google Home" is in sale since Saturday, May 26, 2018. This item is in the category "Home & Garden\Home Improvement\Electrical & Solar\Switches & Outlets\Dimmers". The seller is "go-excellent" and is located in Shenzhen. This item can be shipped worldwide.